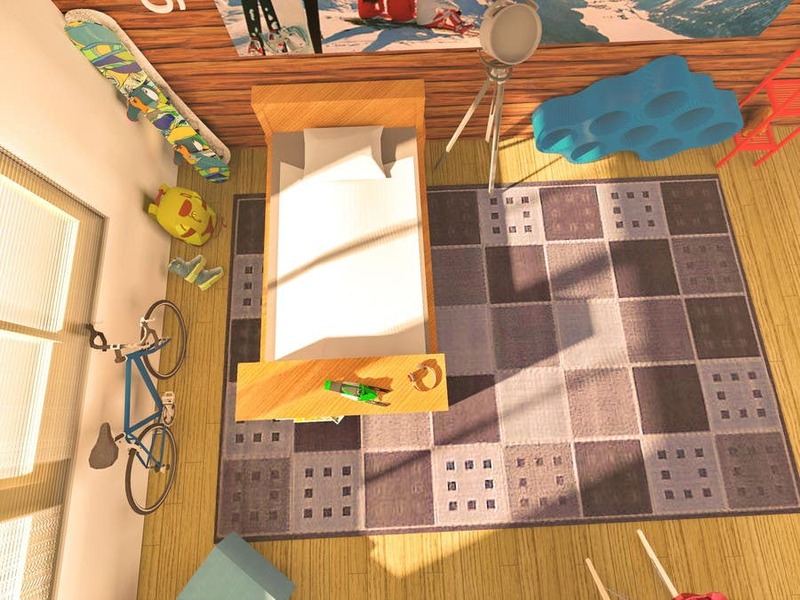 Rooms for boys who have passion for sport,snowboard and winter time. Ok no problem, when do you think you would be able to get it to me? Hope you are feeling better... :-) Where will you be uploading the files to? To my email, or to Freelancer? What then happens if I need changes? Thanks for working on this, I look forward to seeing you revisions! It's just that I really need a final copy asap and me waiting for this is preventing me from launching my product. I need to get these over to the designers asap, which is why I asked that you would definitely have it done by Monday/Tuesday for me. If you can please send me over a copy to approve for final approval that will be great. Thank you. Hi, sorry for late answering,Thank zou verz much for feedback and coment, it is all more than welcome and everything that you asked and requeste can be done very easily.Thing on the right is floor lamp,and next to it is modern shelf unit.Right now I on some buisiness trip, and I will able to make changes very fast on Monday.Let me know please do you have time to wait and see new changed room.Than I will also chenge some thing on Girl room theme,also yout contest.Once again thank you very much,and I hope we''ll stay in contact and finish this very soon.Regards.Dusan R.
The darkness of colours on the room picture versus the above the bed picture are huge. I think I like the darker ones just FYI. Can't wait to see how this looks on Monday! :-) Have a great weekend! Also, can you please make the wall behind the bed, the same colour as the wall on the other design? That room looks amazing. The carpet is going to need to be changed to something that is less busy. Also, can you please make the bike look more real? It may end up that with the wood wall, and the wood floor that it's too much wood, if so, then let's go darker carpet on the floor. Ultimately I need to sell bed linen so that has to be the focus, but the room has to be nice so it set's it up nicely and inspired people to buy the linen! I really really like your idea from above the bed. Whilst the other is also good, it doesn't quite fit the purpose I am looking for. With the above bed design, can you please make it look more real? Please change the colour of the floorboards to be a dark wood, and please change the bed colour also, maybe to white? The rug is a little busy, but perhaps it will look better when the floor and bed change colour. We need to get rid of the light coming through the window and perhaps move it to the floor area at the end of the bed. Let's lower the poster little as well. I love what you've put together here, very impressive!! Can you please put some items in the blue shelving unit, and move the laptop to the shelf at the end of the bed? Whats the thing standing next to the bed on the right? I like it but what is it? Can you move the word "grab" and make it horizontal alongside the board? Let's see how that looks and go from there. :) Good job!! !